I've been at my cornfield hometown in northern Illinois for two very busy and quick months but have headed back to China for 10 months. This decision didn't happen easily, and my heart has definitely struggled with the commitment all summer. You see, this last year in Yinchuan was a truly unbelievable year -- but for many different reasons, it wasn't necessarily the happiest year for me. Thrown into the deep end of a very foreign, traditional, and -- compared to most of China -- rather underdeveloped city, I really struggled with finding a sense of peace. Most days I felt alone, uncomfortable, and psychologically torn. I chose this path out of confidence in mission and in faith; why, then, was my heart often filled with such melancholy? I was no fool; I knew that my year would be hard, I just didn't know how it would be hard. I wasn't prepared for the how. But it's not about the how -- it's about the why. It's about bringing the hope and light of our Father into the lives of those who have been living in darkness. It's about using this time on earth to make the biggest possible guest list for our glorious family reunion in Heaven one day. It was that why that kept me going last year, and it was HIS strength that helped me to persevere. Those days when I felt like a lonely outcast because of my face, felt threatened by my then roommate's choice of questionable houseguests, felt disrespected because I am a single woman, or felt sickened by the worms coming out of my bathroom floor (seriously), I knew that I could find comfort and strength in my Lord. My challenges and situations change every day, but my gracious and loving God does not change. It is this certainty that gives me the courage to try, try again. Now I have journeyed to the "city of eternal spring": Kunming, China. It is the capital of Yunnan Province (the southernmost province in China), and a popular tourist location in China for its lovely climate and flowers that bloom all year long. 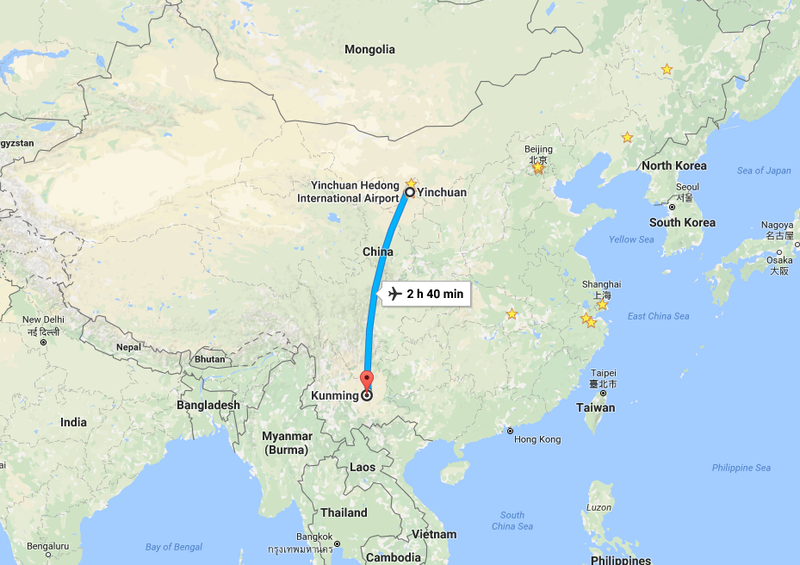 Instead of being way up north in the small, desert city of Yinchuan, this year I will be way down south in the beautiful, larger, ethnically diverse and (a bit more) Westernized city of Kunming. I am hopeful that this location will be a better fit for me and my personality, that I will be ever-strengthened and uplifted to serve HIM better and better each day, and that this experience will be better than the last -- especially since I will actually have teammates this year! My year in Yinchuan was long and spiritually and mentally grueling. But it was not for naught, certainly. I grew in faith, Biblical understanding, and world experience as I faced challenges every day and brought them to the Lord in pπayer and confession. I learned valuable lessons in humility, constantly being reminded that I cannot do this life without help from friends, family, strangers, and my Redeemer. Most importantly, I made connections and planted seeds of faith that I pray the Holy Spirit will nurture for years to come. I pray that the Big Guy will guide me to focus more on this good work instead of on my own selfish wellbeing. That being said, I am human, and I do believe that I will do my best work if I am comfortable and happy. So here's to making the most of my second year in China, and here's to a new beginning. Thank you all for your support, strength, and prayers. Talk to you soon, and stay tuned for new adventures!